Texting was only originally intended for the hearing-impaired who wouldn't be able to take calls in mobile phones. It quickly caught on other people. They found it a quicker and easier way to send messages, rather than calling, especially for short messages. Telecommunication networks used to offer free text messaging services. But people tend to abuse freebies, and it soon created high traffic in their satellites. It pushed these companies to charge fees for texting to limit text usage of their subscribers. Charging fees controlled the public's use of text messaging, and inevitably freed the satellites from unwanted traffic. However, it also brought down sales to a certain extent. By charging text messages for free again, the telecommunication companies won back their customers. Free text messaging is not at all free. Telecommunication companies get profits from sponsors and advertisements. It also entices clients to try out their other services out of gratitude for the freebies offered. Most free text messaging services are availed online rather than in mobile phones. And these websites have many banners around it. These are advertisers that pay the telecommunication company for every click on their banner. The dotcoms have now provided another free way to send text messages through computers (PC). There are three types of online facilities that can send free SMS to a mobile phone. First are the websites of wireless telecommunication carriers. They offer free text messaging as added service to their subscribers. It encourages people to login, subscribe and browse the website's contents. It also encourages people to try their other services like paying bills online or viewing bill statements through their website. Second are instant messaging (IM) clients. 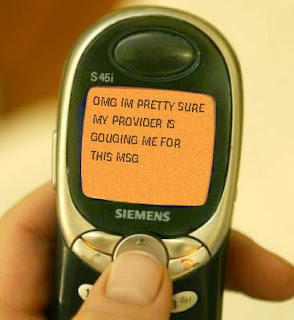 Most IM clients allow two-way PC-cell phone-PC text messaging. The dotcoms don't charge you any but your wireless carriers may apply charges on the cell phone-to-PC route (See how your wireless carriers are earning from texting? ).These IM clients normally offer SMS services as adjunct to their basic instant messaging platform. These dotcoms normally partner with wireless carriers to bring you their services on the go. Their services become part of your carrier's WAP offerings allowing them both to profit from your continued patronage. Third are the online communities and all other dotcoms offering the luxury of sending free SMS from their websites. At first it would seem they are not making money from offering you free text messaging service. But actually it is advertising. People flock where the freebies are. And more people mean higher traffic, and more chances to get sales from their websites. It is an effective marketing tool. People nowadays just caught the hype of texting. And that's why these free services offered online are such a hit. Freebies are always awesome. But remember not to be abusive for these companies to continue giving us the best services they can offer us. And although free, it does not give us the excuse to send any kind of text we want, especially if they are harmful and abusive contents. There is always an etiquette to live by. For more information on free SMS and Free SMS to India please visit our website.